How do you maintain a culture that really works when the company is growing significantly and has offices in different countries? 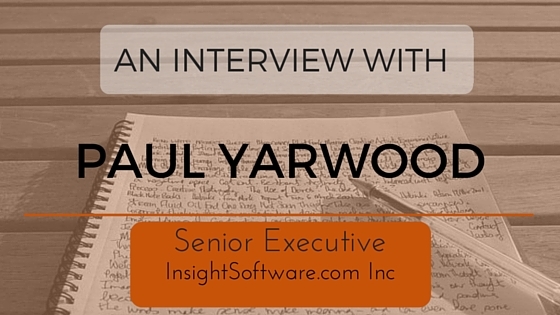 According to Paul Yarwood, it is about having non-negotiable core values. And even if you are incredibly good at what you do, but don’t share those core values then you can’t stay in the company. For the beady eyed amongst you, you will notice a common surname between Paul and I. Paul is my brother-in-law and I was delighted that he agreed to kick off this interview series for me. An easy start for me, yes, but the truth is I have always been secretly impressed by what Paul has achieved. You see for the twenty plus years I have known Paul, he has been a leader in what has now become Insightsoftware.com. The company is unrecognisable from what it was in the early 90s in many ways, but the ‘quirky’ culture that works so well is still very much there. Paul, can you briefly describe what your business does? Insightsoftware.com provides software solutions to help its customers grow their business by better understanding, managing and predicting their business performance. Our Hubble product is the only truly integrated reporting, analytics and planning solution in the market that’s purpose built for JD Edwards and Oracle E-Business Suite. How would you describe the culture in your business? Our culture is based on trust. I believe it’s the foundational component for all other aspects of culture. We place a great emphasis in our business on communication and collaboration. We also encourage our staff to be both entrepreneurial and customer-obsessed. We’re a quirky bunch and have plenty of fun too. Your company has seen significant growth over the last few years, has the culture changed? The culture is always changing as new people join – it’s important that everyone gets to shape the culture. However, it should always be based on non-negotiable core values that provides a common thread for everyone in the business. I’ve definitely experienced talented people who’ve not fit these values and been unsuccessful as a result. You simply have to move them on – I don’t care how “good” they are. You are a global company, does your culture vary across offices? Yes, and I think that’s normal. I believe a culture should be based on a few foundational core values, regardless of location, but we’re not trying to destroy the essential identity of that office. I run our US business and operate on the same common set of values as my European colleagues, but everyone in our business brings something unique to our culture and you would not want to negatively impact that. What volume of attrition do you see in your business? We see attrition when there’s a poor cultural fit. We went through a period of time as we were growing when I noticed we had more attrition than usual. Our mistake was putting too much emphasis on knowledge, skills and experience and not recruiting for core values and ability to fit into our culture too. We realized we needed to write down these core values and find ways of communicating and re-enforcing them at every opportunity. You can have a bit of fun with it too and we certainly had some very positive feedback from our customers who’ve visited our offices and sought our advice – it seems like we’re not the only ones who are focusing on culture! What do you think makes people stay in your company? People want to be rewarded for a job well done of course, but I also I think people look to the leadership of the company to be inspired to a cause that’s greater than themselves. They want to be involved in doing great work and get their motivation and inspiration for working with talented colleagues. That’s where the culture comes in. As a leader, I believe my primary responsibility is to create a great environment for talented people to succeed and that’s why I obsess around striving to create a high-performance culture. How do you make sure that you recruit the right people? Acquiring great talent is always hard. Top talent is usually heavily entrenched in roles that are already hugely rewarding and so convincing them to join your organization is challenging. We spend a lot of time articulating our vision for the business, vetting the candidates and recruiting based on core values as well as competency in the role. We believe “fit” is just as important as knowledge, skills and experience. A high-performance culture is definitely a draw for top talent and we’ve had some tremendous success at leveraging our culture to attract talent from organizations larger than ourselves because they find our organizational culture to be attractive. What do you do in the first few weeks to get them up to speed both in their job and understanding how the business works? As we have grown, we’ve introduced a formal on-boarding process. In the early days of the business, it was definitely a “welcome to the company, let me drop you in the deep end” approach, but that’s not sustainable. So we worked hard at on-boarding. It’s something that’s always evolving as we learn and improve. Our on-boarding process includes a two-week induction to both the company in general and the role specifically. We assign a mentor, train everyone on our products and conduct a 90-day review, with a 30-day check in. During this check in, we solicit feedback on the on-boarding process, so we can continually improve how we bring talent into the business. What advice would you give someone that was losing a high volume of staff? Where would you start? Retaining top talent is just as hard as attracting it. It’s a never-ending quest. In a high-mobility economy it’s so easy for top talent to leave for a better opportunity. I’ve lost a few good people over the years that I wished had not left, so I can empathize with anyone struggling to retain great talent on any sort of level. This is where culture is so important. If you can get the culture right and hire the right talent that fits with the culture, retention is always easier. Of course, you can’t rely on that solely, but it improves your odds of keeping talent and growing your business. Anything else that you think is important that I haven’t asked? You’ve not asked me about the negative consequences of hiring talent that is not a good cultural fit. I’ve had my share of those mistakes too and in my experience it introduces so much friction into your business and slows us down. Everyone makes hiring mistakes, but poor cultural fit is one that quickly becomes apparent, so my advice is to act on it sooner rather than later. But don’t take Paul’s word for it. Check out this video to hear what his team have to say.